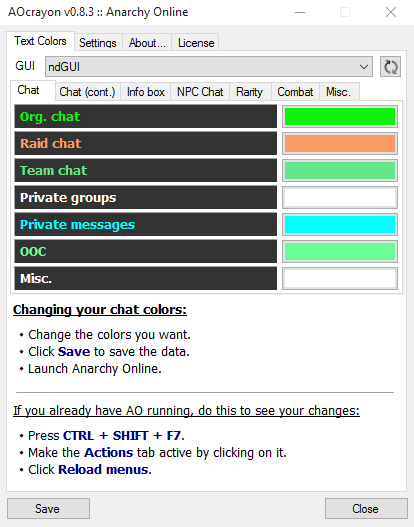 AOcrayon is a third-party tool that was made with the intent to help players of Anarchy Online change their base chat text colors easily, without mucking about with 'complex' xml file editing. Note: This changes only what you see. It has no impact on anyone else. Special thanks to Oofbig for coming up with the cool name! Change your chat colors to whatever you want them to be using a color picker. Supports custom GUIs (version 0.6.0 and above). Advanced mode for changing any color listed in the TextColors.xml file. Doesn't do anything to your output, so don't worry about someone else being annoyed with your changes. In AO, open the debug window by hitting CTRL + SHIFT + F7. In the Actions tab, click Reload menus.